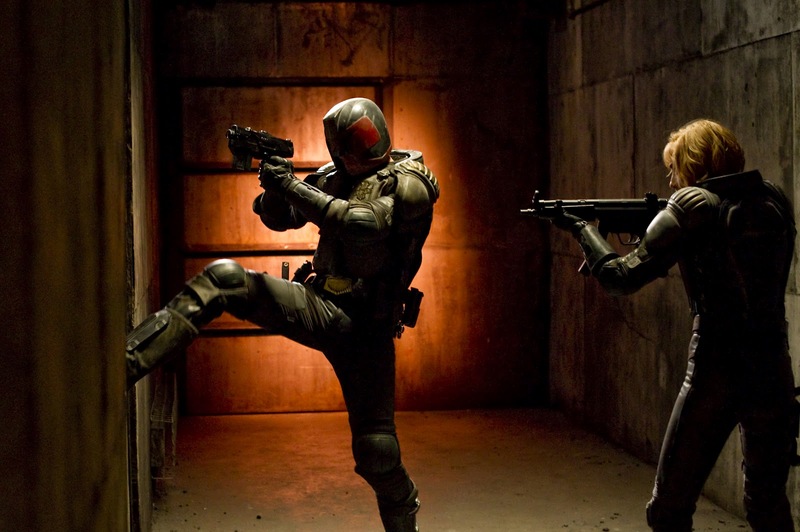 Set in a hyper-violent future, Dredd takes the rogue cop film to its farthest extreme. Here killer cops don’t have to worry about meddling Internal Affairs liaisons or covering up incriminating evidence - it’s part and parcel of their jobs to dole justice that ranges from mandatory minimum jail sentencing to execution on the spot, depending on the crime. Reflecting their dual roles, these police officers are known as judges, and the most uptight cop of all is Judge Dredd (Karl Urban, Star Trek). If he seems noble, it’s only for the fact that he’s unquestioningly by-the-book and doles out justice (seemingly) without hatred. The crime rate is sky high in Mega-City One (a remaining human enclave after nuclear war) and during the proliferation of a new street drug known as "slo-mo," Judge Dredd takes to his beat with the police force's latest trainee, Judge Anderson (Olivia Thirlby, Juno). On her first ride along, Anderson chooses to respond to a drug related gang slaying in the Peach Trees Block, a 200-story Arcology. As the Judges arrive, the leader of the slo-mo gang, Ma-Ma (Lena Headey, 300), locks down the Peach Trees and offers a bounty on the Judges before she'll open the building back up. With jammed radio transmissions and a thin police force preventing back up, the Judges make their way up the building, level by level, until the final, inevitable showdown. Dredd distills a vast comic book mythology and dozens of crime fiction tropes, most notably rookie fiction and siege films. Dredd is also a police state fantasy, where the only two functioning industries seem to be crime and punishment. 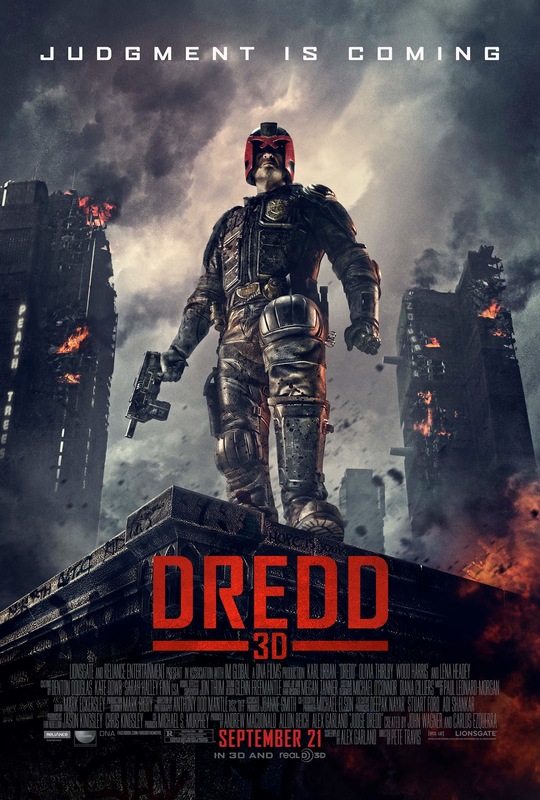 It’s not clear that the film endorses or condemns the society presented in Dredd, and it's unexplored what governing body grants the Judges their power. While he doesn’t seem to have any overt hatred, Dredd also hasn’t a hint of empathy for any of his perps, which are often poverty stricken. Judge Anderson has reservations about serving justice the way Dredd does, though during the film’s frequent, high-body-count action sequences, there isn’t a lot of time to explore the socio-political underpinnings of this sci-fi universe. Certainly, all but the most authoritarian of viewers will find fault with the police state or at the very least, not want to live there. Slo-mo, as one might expect, drastically slows the user’s perception of time and like many drug films, justifies the use of trippy special effects. Here, Dredd slows the action down almost to the point of abstraction as bullets blow apart bodies. It's doubtful that the slo-mo segments would be as visually striking in 2D (the credits also are visually interesting), but unfortunately the film seems to have problems staying in 3D. Anytime a reflective surface was on screen, I found myself seeing double frames even while wearing 3D glasses. It’s unclear if this is a problem with film itself or with the projection during the screening I attended. Unlike many of this generation's remakes, reboots and re-adaptations, the Judge Dredd property was a prime candidate for a new film version being that 1995's Judge Dredd was mediocre at best. Thanks to expert pacing, respect for the source material and reworkings of tried-and-true cop film formulas, Dredd is a fantastic, gruesome genre film. Dredd was adapted from the 2000 AD comics spin off Judge Dredd by John Wagner and Carlos Ezquerra and was directed by Pete Travis based on a screenplay by Alex Garland.